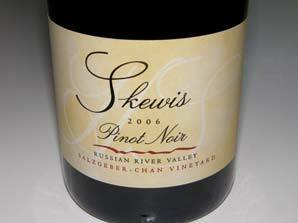 Hank Skewis is a veteran of over 25 vintages who honed his winemaking skills at Lambert Bridge in the Dry Creek region of Sonoma County before starting his namesake label with his wife Maggie in 1994. That year, grower Fred Peterson of the Floodgate Vineyard in Anderson Valley (now owned by Goldeneye and renamed) offered Hank three barrels of grapes and Hank released 70 cases. Today, Hank crafts less than 1,000 cases annually of premium Pinot Noir from superb vineyards in Sonoma’s Russian River Valley and Anderson Valley appellations. He works out of a shared crush facility, attempting to keep overhead low to match projected income. Hank works with growers to restrict yields by winter pruning, spring shoot thinning and summer cluster thinning before veraison. He prefers to limit crop yields to 2 to 2.5 tons per acre. Winemaking is traditional with minimal intervention. Grapes are gently crushed into small bins, fermented warm, pressed into French oak barrels where primary and secondary fermentations are completed. The wines are typically aged in barrel for 18 months, racked for blending, and then racked a second time in preparation for bottling. They are then aged an additional 4 to 6 months in bottle before release. 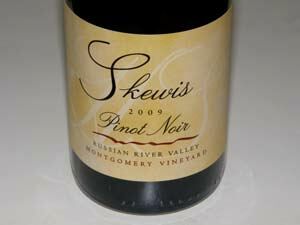 Skewis wines are available on the website, through a mailing list, fine wine retail stores and restaurants. A small tasting room is located in the historic Roma Station Winery complex at 57 Front Street in Healdsburg. Hours are 11-5 Fri-Sun and by appointment. The charming tasting room was one of the 15 best tasting rooms in Sonoma County according to sonoma.com. 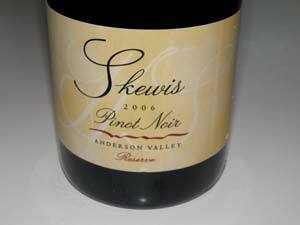 The website has a valuable section about matching Skewis Pinot Noirs with food and cheese. 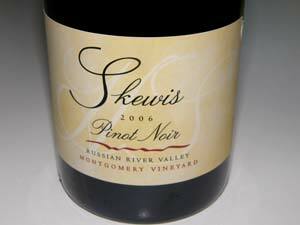 I have had a number of older vintages of Skewis Pinot Noir and I can vouch for their age ability. 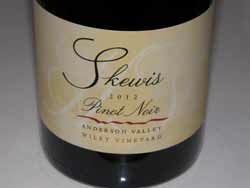 In February 2016, it was announced that 2014 would be the final vintage for Skewis Pinot Noir.